Almost 30 different wood decors ranging from “elegant oak” to “dark mahogany” to fulfil most design requirements. 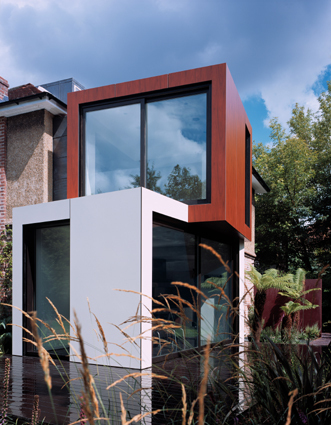 Matt and Satin finishes assist in recreating the distinctive look of a natural wood facade. 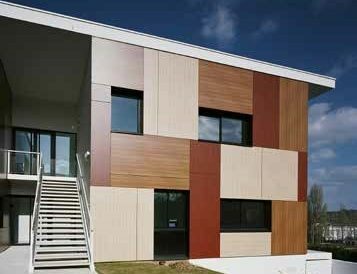 Trespa Meteon high pressure laminate panels are highly durable and environmentally friendly. Produced using a blend of up to 70% natural fibres and thermosetting resins creates a panel with a good strength to weight ratio. Using high temperatures and pressures to manufacture the panels ensures a dense and highly stable panel. 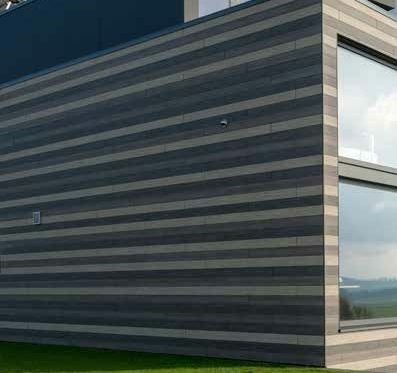 The extremely versatile cladding provides endless possibilities and can be used for other exterior cladding needs, such as balconies and sunblind solutions. For more information on the Trespa Wood Decors range please contact your local branch.